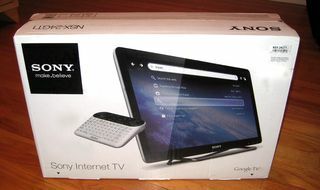 Last month, Sony once again reduced the prices of their Sony Internet TVs and today, I have one 24" Sony Internet TV, model NSX-24GT1, to give away to one lucky reader of my blog. (Retail value $295). This model is the one with the Google TV platform, which is going to get a major software update in the next few weeks. To enter the drawing, all you have to do is leave one comment on this post and make sure you submit the comment with a valid email. The drawing is open to anyone with a mailing address in the U.S. only, and I will select one winner at random at the end of the month. Good luck!